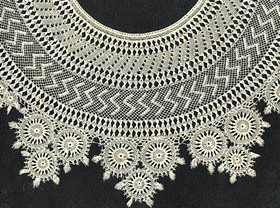 In addition to needlepoint and bobbin lace techniques, a variety of structures have been used to create stunning open, lacy fabrics: netting, crochet, cutwork, knitting, tatting, embroidery and appliqué among them. 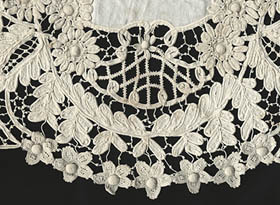 Although these sometimes copied the more expensive and labor intensive laces, all were used creatively at times to produce fascinating textiles that were far more than "imitation lace." 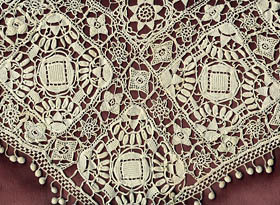 Indeed, some of these structures were among the earliest laces. Click on the links below to see larger photos and magnified details of the structures. The laces below have all been sold, and are posted here solely for informational purposes. 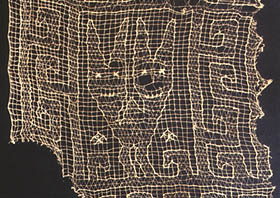 Plain knotted netting was made with a small shuttle and gauge rod, then the net was stretched on a frame and patterns needle-woven into the net. 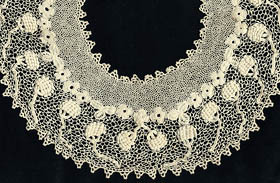 Originally called "lacis," this was one of the oldest forms of lacemaking -- one used frequently in 16th and 17th century Italy. 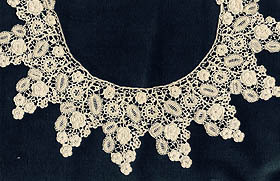 The technique was revived in the mid 19th century and adopted enthusiastically by Victorians. 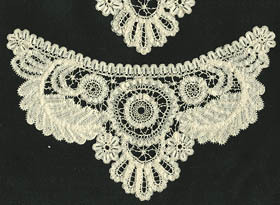 Like many other laces, the technique was widely copied by machine processes well into the 20th century, but handmade examples are easily identified. Small individual fishermen's knots can be seen at each corner of the square-meshed netting. 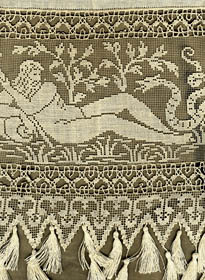 In the purest pieces, designs were produced solely in linen weave, while in others, longer darning stitches were used for contrast. 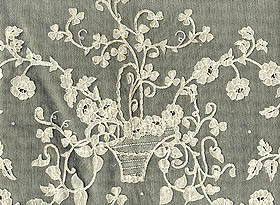 Most often 19th century filet lace designs were composed of abstract, scrolling floral motifs that reflected Renaissance patterning. 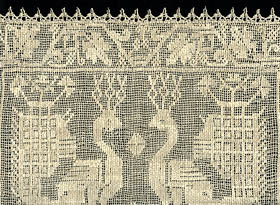 But allegorical scenes were popular in early filet lace too and reappeared in Victorian work, like this anti-macassar. 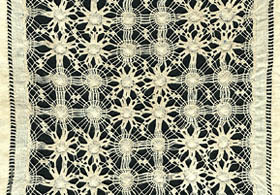 This piece was enhanced with Torchon bobbin lace borders and shiny linen tassels. Lions grace small side panels. 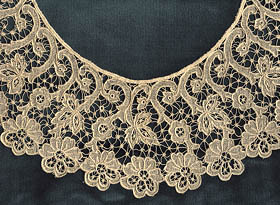 In 16th century Italy, another lace was made with needle interlacing on gauze fabrics. 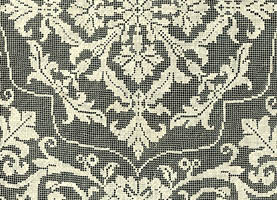 The ground cloth was handwoven first on a loom in a leno structure featuring twisted pairs of warps. 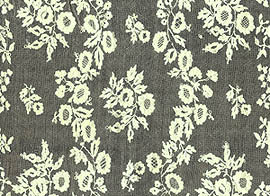 The needleworker turned this fabric sideways and interlaced her pattern yarns with stitches that paralleled the warps. 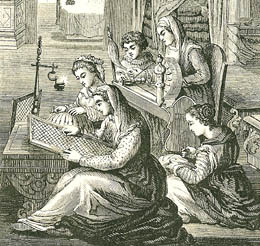 In my example, linen threads of three different weights and spins were contrasted, but the overall effect remained rather heavy. 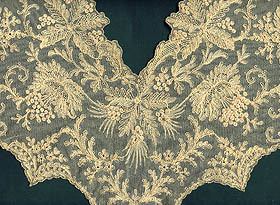 This was an ecclesiastical lace in which peacocks and vine branches carried religious significance. 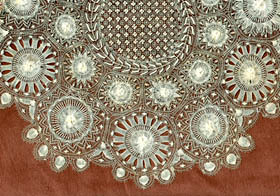 This panel was edged with bobbin lace. 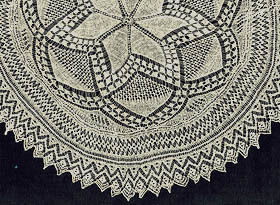 Of all the laces on these pages, tatting and crochet were the primary types that occupied American needlewomen in the past. 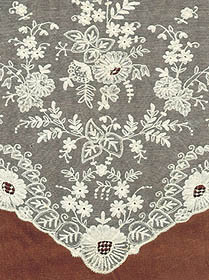 I well remember sitting with my grandmother as a young child, learning how to manipulate a small silver tatting shuttle. A series of knots were tied along a foundation thread, then pulled up into tiny circles or scallops. 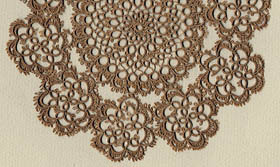 Tatting was popular from about 1850 on, primarily for medallions and narrow dainty edgings for garments.